We don’t know much about what Greenland sharks do, but we do know that whatever they do, they do it painfully slowly – and this results in an astonishingly long lifespan. Peter Bushnell and his colleagues recently published a landmark study in Science that reveals just how long these enigmatic sharks live. An 11-foot Greenland shark Somniosus microcephalus glides past a submerged ice ledge. For societies of hunters and fishermen in the Arctic Circle, the Greenland shark that was once a critical resource has become a source of great irritation. For centuries, these First Nations hunted the mysterious, deep-dwelling carnivores for oil for their lamps and food to power their all-important sled dogs. But in more recent years, Greenland sharks have become a nuisance – to the extent that in some places a bounty is paid for their hearts. And according to a recent article published in Science, these hearts are among the oldest vital organs on our planet. Greenland sharks are notorious for getting themselves entangled in the long-lines and gill nets that fishermen depend upon to make a living from catching halibut. In 2009 it was reported that the sharks made up more than half of the waste disposed of by residents of Uummannaq, a small town on the western coast of Greenland. At the time, technology experts were suggesting that Greenland shark remains be turned into biofuel and that shark by-catch could supply the town of 1,300 people with 13% of its energy needs. The Greenland shark is the largest elasmobranch native to polar waters and can be found all along the Arctic Circle from eastern Canada to north-western Russia. Between 1770 and 1963, thousands of Greenland sharks were harvested for their livers, which provided oil for lamps. Trade reports suggest that every year from 1890 to 1940 more than 30,000 animals were killed in Greenland’s waters alone. This brief period of commercial importance gave rise to studies by Danish and Norwegian researchers, but for the most part the Greenland shark has remained what Bushnell describes as ‘an enigma wrapped in a conundrum’. And the more he tried to unwrap it, the more interesting and bizarre it became. Greenland sharks at the surface on a recovered long-line. The sharks were caught at the bottom of the 500-metre-deep (1,640-foot) Ammasalik Fjord during field work in 2012. Growing to more than five metres (16 feet) in length and weighing more than 1,000 kilograms (2,205 pounds), the Greenland shark is one of the largest predatory shark species in the world. But when Bushnell first encountered these giants, it was not just their size that struck him. ‘I was amazed at how large they were – and even more amazed at how lethargic they were. They just lay there. When we caught them on a long-line, it was sometimes difficult to tell a live one from a dead one.’ It is not hard to imagine why scientists named the shark Somniosus microcephalus, meaning ‘sleepy little brain’. Their lack of speed notwithstanding, most Greenland sharks have hitchhikers that dangle from the surface of their eyeballs: parasitic copepods that attach themselves to the cornea. Scientists suspect that the presence of these seven-centimetre (three-inch) hangers-on may render the sharks partially blind, but as they exist in such a deep, dark world, it is doubtful that they have much use for sight anyway. Greenland sharks are usually found between 300 and 600 metres (1,000 and 2,000 feet) deep but have been tracked to beyond 1,800 metres (6,000 feet). The frigid water temperature at such depths ranges between -1 °C and 6 °C (30 °F and 43 °F) , which makes it possible for the species’ metabolic rate to be very low. This, in turn, leads to one of the most startling of all this enigmatic shark’s mysteries: its incredible lifespan. Ironically, the key to this secret lies in the lens of the Greenland shark’s parasite-infected eyeballs. With the help of a group of international collaborators, Bushnell, Steffensen and Julius Nielsen (a PhD student from the University of Copenhagen) applied a radiocarbon dating technique to the shark’s eyeballs that has never been used with animals before. In doing so, they have dragged the Greenland shark from relative obscurity to the heights of biological fame as the oldest known vertebrate species on the planet. A crucial element of Bushnell’s study is the atmospheric bomb pulse – a radical injection of carbon-14 (a kind of radioactive carbon) into the atmosphere – that resulted from the testing of hydrogen bombs in the mid-1960s. This sudden and dramatic increase in carbon-14 (bomb-carbon) was quickly incorporated into both terrestrial and marine environments, making all creatures living at the time part of the world’s largest chemical-tagging experiment. The higher levels of carbon were incorporated into the marine food web over the next decade, and the fact that they can still be identified in organic tissue enables scientists to determine the age of that tissue. Radiocarbon ageing techniques, such as the use of bomb-carbon, have been proven to work when tested against simpler ageing techniques, such as counting the growth layers in the otoliths (tiny ear bones) of bony fishes or in the spines of some shark species. However, the simpler method cannot be applied to the Greenland shark because it is cartilaginous and has no calcified structures. This is why Bushnell and his team had to find an alternative technique: carbon-dating tissue from the lens of the shark’s eye. ‘The fundamental assumption is that the nucleus of the eye lens is more or less inert,’ explains Bushnell. ‘This means that whatever the isotopic carbon ratio is in the nucleus, it is a reflection of what the environment was like when the animal was conceived.’ The basic principle is that if the eye lens of an individual shark has been imprinted with the bomb pulse, the animal was born later than the early 1960s. To prove their theory, the researchers needed eyeballs. 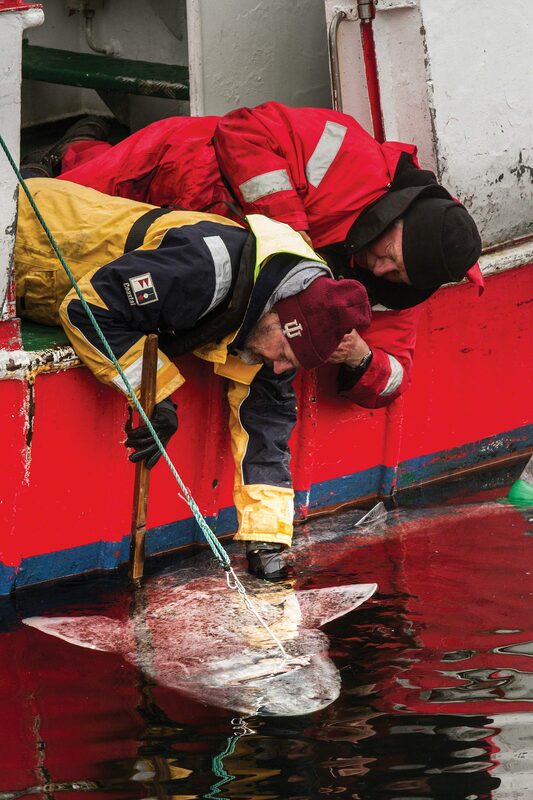 Most of these were obtained through collaborating with commercial trawlers and the Greenland Nature Institute, which provided them with samples from sharks caught as by-catch, but the team also needed to collect samples of their own. Working in one of the coldest and most remote places on earth is a logistical and financial challenge. ‘It’s the remoteness of the field site that affects the expense. To work in eastern Greenland, for instance, you pretty much need to have a large, 60-metre (200-foot) research vessel,’ he explains. After five years, four expeditions and funding from numerous organisations, the team managed to collect the data they needed. Since 2011, the researchers have been travelling to the frigid, iceberg-studded regions of the Arctic every summer – when it’s perpetually daylight – to conduct their field work. RV Sanna from the Greenland Institute of Natural Resources near a glacier front close to Upernavik, northern Greenland. During field trips, the team spends weeks on research vessels off the coast of Greenland setting long-lines to catch sharks. ‘There’s nothing like bouncing about in a small rubber boat, hands numb from the cold water, feeling dwarfed by icebergs as they float by, and with an extremely sulky, large and powerful shark 20 centimetres (eight inches) from your face to remind you that this is its world and you are nothing more than an unwelcome intruder,’ reflects Bushnell. In order to estimate the ages of individual sharks, the team has examined the eyeballs of 28 Greenland sharks caught in fjords and offshore waters. The animals ranged from 80 centimetres (32 inches) to 5.02 metres (16.5 feet) long. After testing the nucleus of each eye lens, the researchers discovered that only three sharks, all smaller than 2.2 metres (seven feet), displayed signs of the bomb pulse. This meant that the 25 larger animals had to be more than 50 years old. To age the other sharks, the researchers needed to use carbon dating in another way that would enable them to see further into the past. Peter Bushnell leans out of the research vessel to unhook an upside-down Greenland shark. The level of radiocarbon in food webs has always fluctuated slightly over time. To determine the age of their sharks, the team plotted the carbon measurement of each sample against Marine13, a radiocarbon calibration curve that has already been established. This enabled them to go back in time hundreds of years and determine an average age for Greenland sharks based on the relationship between size and age. Their results, which suggest that Greenland sharks are not only some of the most ancient vertebrate species on the planet but also the longest-lived, have rocked the biological community. Radiocarbon dating does not provide exact measurements, but in conjunction with statistical models it enabled the scientists to estimate an age range. The largest shark in the study was just over five metres long. According to the scientists’ models, this means it could be between 272 and 512 years old – a seriously old fish and easily longer-lived than the bowhead whale that previously held the record at an estimated 211 years. When the story about these ancient creatures of the ocean broke, it garnered sensational public interest and was widely published by mass media. 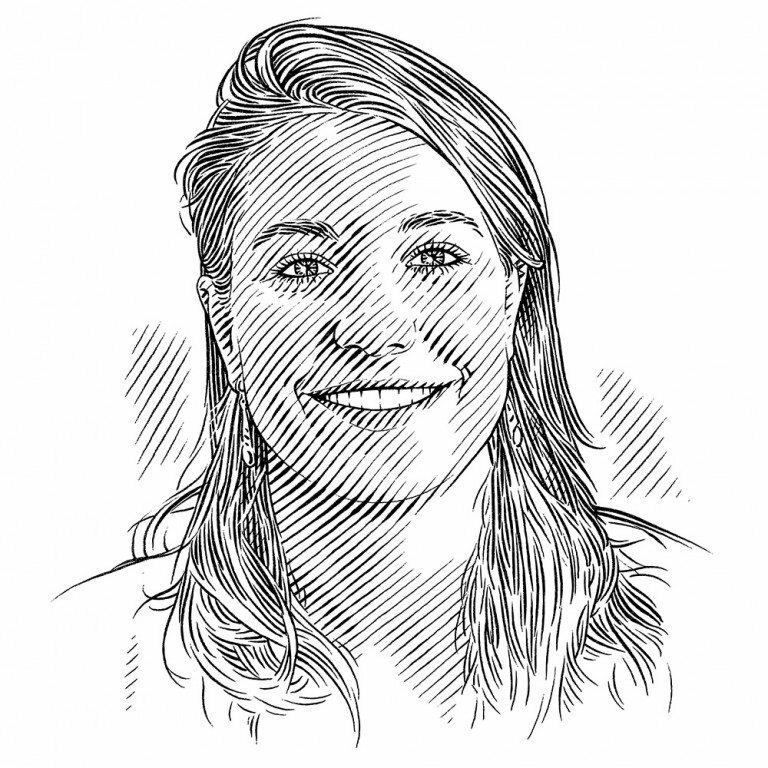 For shark researchers, however, the findings are more than just fascinating; they are important because they point to serious issues concerning vulnerability and conservation. 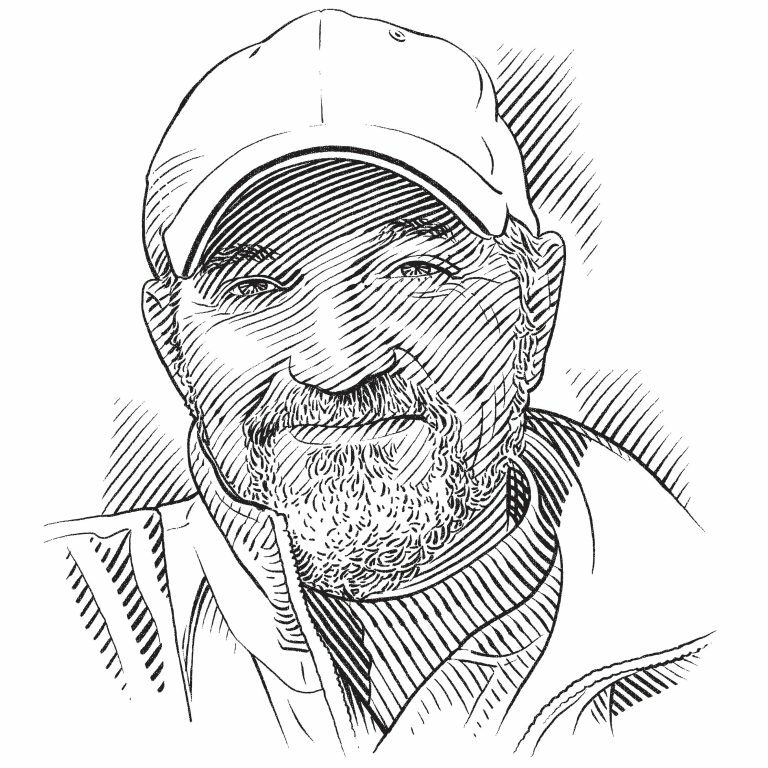 Despite numerous expeditions to Greenland and having caught and tagged more than 60 sharks in the past five years, Bushnell and his team have never captured a pregnant female. In fact, there is only one scientific report of a pregnant female; her pups were near term and measured 40 centimetres (16 inches) long. Tag-and-recapture experiments performed between 1936 and 1952 suggested that Greenland sharks only grow 5–10 millimetres (0.2–0.4 inch) per year and female Greenland sharks only become sexually mature when they are 4–4.5 metres (13–15 feet) long. The research indicates that at this size they would be about 150 years old; a very long time to wait before being able to reproduce. This means that although the sharks may seem common throughout the Arctic – at least common enough to be considered a source of biofuel – very few of them are actually big enough to breed. And with such slow growth rates, it will be decades before the younger generation, in turn, is ready to procreate. Moreover, although the largest shark on record only measured 5.5 metres (18 feet), Bushnell has heard stories of animals as long as 6–7 metres (20–23 feet). Perhaps the liver oil fishery took its toll on these enormous and very old sharks or perhaps, as he points out, the tales of seven-metre giants are just ‘fishing stories’. 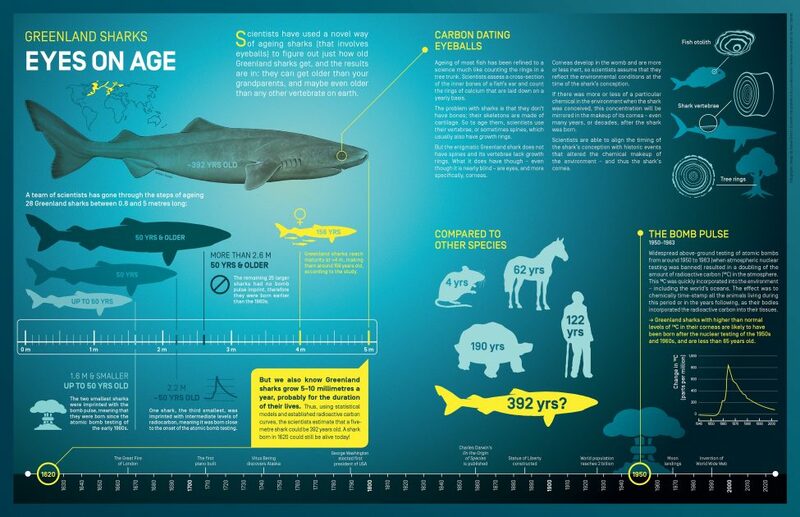 The study published in Science is really just the first step in learning how to age such long-lived elasmobranchs. With more samples, especially from very big and very small sharks, researchers may be able to narrow down their estimates and achieve more accurate age measurements. In the meantime, though, it seems safe to say that some of the individual Greenland sharks that are still swimming through the waters of the icy north were born long before Charles Darwin. These sharks are such masters of evolution that some of them have been alive longer than the theory itself. Greenland’s First Nations have their own theory about the origin of these very old fishes. Legend has it that at the dawn of time a woman washed her hair in urine and dried it with a cloth that was subsequently blown into the sea and became the world’s first Greenland shark, skalugsuak. An unappealing tale perhaps, but it gives us great insight into the disagreeable relationship between the sharks and the people that share their home. Moreover, the fresh meat of the Greenland shark has a very high urea content that makes it toxic. Sled dogs have been seen lurching around unsteadily after eating it, giving rise to the local phrases ‘drunk as a dog’ and ‘shark drunk’. Given the story of the Greenland shark’s origin and its nuisance value to fishermen, it is not hard to imagine why this is a ‘wanted’ species. Yet this attitude seems a little short-sighted considering what Bushnell and his team have shown. Hopefully, this new knowledge will transform the image of the Greenland shark from ugly nuisance to the living ancestor of the Arctic seascape. The team’s research in Greenland was funded by the Save Our Seas Foundation, the Danish Research Council, the Danish Centre for Marine Research, the Greenland Institute of Natural Resources, the Carlsberg Foundation, National Geographic, the University of Tromsø and the Blue Planet Danish National Aquarium.